Andre Rieu is the world’s most successful violinist who often tours across the world with his Johann Strauss Orchestra, performing waltzes so iconic that audiences are known to join in the dancing. Rieu was born in the Netherlands in 1949 and began studying the violin from a very young age. He has since received a number of accolades including the Order of the Lion from the Netherlands as well as a handful of Classic BRIT Awards for Album of the Year. In July 2015 Rieu beat One Direction and Take That’s previous Box Office records for the hightest grossing music concert in UK and Irish cinemas with his iconic Maastricht concert. 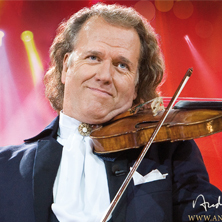 To be the first to hear when more André Rieu tickets go on sale you can sign up to the Eventim TicketAlarm below.